It is important to keep your engine oil both full and fresh. Doing so will allow your engine to stay properly lubricated and protected, extending its life. HI. Thank you so much!!! -very well and competently packed goods for shipment...... 100% Accepted and Satisfied! Thanks!!!! 5 stars! Best on line price is at Jacks! 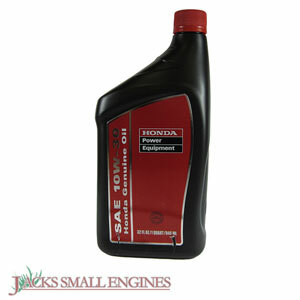 Ask us about the Honda 0820710W30 10W30 Engine Oil (1 Quart). Please no repair questions. Your Q&A may be posted to Jackssmallengines.com to help other shoppers, like you, with their purchasing decisions. Thank you.